About 18 million Americans currently have some form of sleep apnea. This is an unusual disorder where your breathing slows or outright stops periodically while asleep. In addition to being uncomfortable and disruptive to a good night’s rest, sleep apnea places you at an increased risk of ailments ranging from high blood pressure to stroke or diabetes. The reduced blood flow and oxygen can even result in brain damage. Fortunately, damage caused in this way is not as significant as, say, the damage caused by conditions like Alzheimer’s or Parkinson’s. Still, it will be within your best interests to know how to recognize and respond to the problem. Obstructive sleep apnea (OSA) is the form of the disorder linked most to brain damage. As the name implies, OSA is when something is physically obstructing the upper airway either partially or in full. When the blockage occurs, your body responds by the diaphragm and chest muscles working harder to overcome the obstacle and breathe. The result is usually noticeable as a loud gasp, snort, or jerking of the body that can be strong enough to wake you up. The cause of the obstruction is actually your throat muscles. During sleep, these muscles relax and can periodically block the airway. In a mild obstruction, this appears as snoring. In a more significant blockage, OSA is the result. In children, swollen tonsils can also cause an obstruction. How all of this leads to brain damage is actually very simple. Like anything else, your brain needs oxygenated blood to function. Obstructive sleep apnea can weaken blood flow to the brain both by lessening the oxygen you take in and by placing strain on the heart. As mentioned above, the diaphragm and chest muscles have to overexert to overcome the obstruction and the heart is part of this response. The disruption of the normal flow of blood can compromise brain tissue. A secondary cause of brain damage is the rush of oxygen the brain receives when a sleep apnea episode ends. The brain is used to a steady stream of oxygenated blood, not a sudden flush after a period of absence. If this repeats too often, it can disrupt brain tissue and result in damage over time. Which Parts of the Brain Get Damaged By Sleep Apnea? Right insular cortex: This section regulates various aspects of the autonomic nervous system that controls internal organs. In particular, this cortex governs baroreflex control—the ability of the heart to quickly respond to changes in order to maintain constant blood pressure levels. Damage to this area can result in difficulty managing blood pressure and increased or decreased sensitivity to pain. Ventrolateral medulla: This governs breathing and blood pressure regulation. While the right insular cortex affects the baroreflex system for maintaining steady pressure, the medulla affects how the heart reacts to sudden spikes or drops in blood pressure. If this region is injured, delays in the heart’s response to changes can occur as well as irregularly distributed responses that can lead to erratic rhythms. Hippocampus: This region is responsible for processing short and long term memory along with spatial navigation. Directional confusion and difficulty with memory are signs of potential injury. Cerebellum: This section regulates other aspects of blood pressure control, breathing, and motor coordination. Damage affects how well it can coordinate movement and vascular activities, leading to balance difficulties. It is worth noting that the effects of brain damage caused by OSA is going to be much milder than that caused by, say, Alzheimer’s or Parkinson’s. Brain damage can refer to brain cells that are still alive but simply not functioning at their normal level. This is a good thing since it means these low-functioning cells can be restored using the right methods. A small study from 2014 has offered an intriguing option that may be able to reverse the brain damage caused by obstructive sleep apnea. The study looked at 17 men as they used a continuous positive airway pressure (CPAP) device over a year and found that the damage to the gray matter portions of the brain were reversed after three months, with the white matter reversing after the full year. A CPAP machine looks vaguely like a clock-radio and is about the same size as one. The device has a hose attached to it that connects to a mask, nose cover, or nasal prongs, and you wear this while sleeping. CPAP therapy works by maintaining pressure levels in the throat to prevent the airway from collapsing. In addition to helping reverse brain damage, a CPAP device also prevents snoring. Weight loss: The benefits are more noticeable in overweight individuals, but something as minor as a 10% reduction in weight can have a noticeable impact in reducing obstructive sleep apnea episodes. Alcohol moderation: Specifically, don’t drink within a few hours of bedtime. Alcohol can help trigger apnea episodes. Quit smoking: Smoking causes airway issues, fluid build up, and phlegm that contributes to sleep apnea. Position change: Some people find that they only have episodes when sleeping on their back. Try sleeping on your front or on the side for a few nights and see if that improves things. You can also try keeping your head elevated. Avoid sleep aids: Much like alcohol, sedatives can make you more vulnerable to episodes and prolong them. Consider herbal treatments like valerian in order to make yourself drowsy without the side effects. Use a mouthpiece: Certain oral devices are held in the mouth while you sleep and will help manage OSA by holding the airway open. This is usually done by keeping the jaw in a certain position or moving the tongue. It is best to consult with your dentist in order to get a mouthpiece fitted properly. Decongestants: Sometimes OSA can be caused by getting too plugged up at night. A decongestant, nasal spray, or even some hot tea can all be tried to clear the sinuses before bed. Sleep apnea can be unpleasant enough without throwing brain damage into the mix. Try some of these methods and talk to your doctor so that you can get back to a sound, peaceful rest. 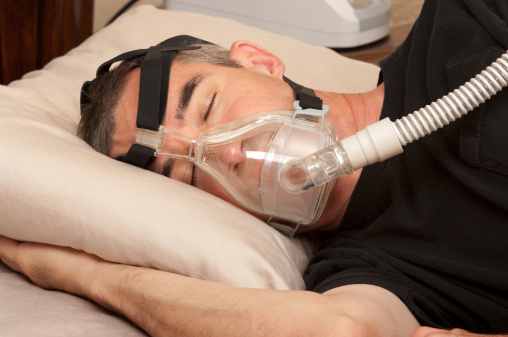 “Continuous Positive Airway Pressure (CPAP) Therapy for Obstructive Sleep Apnea,” WebMD web site, September 9, 2014; http://www.webmd.com/sleep-disorders/sleep-apnea/continuous-positive-airway-pressure-cpap-for-obstructive-sleep-apnea. “Obstructive Sleep Apnea Syndrome (OSA): Causes, Symptoms, Treatments, and More,” WebMD web site, November 16, 2014; http://www.webmd.com/sleep-disorders/guide/understanding-obstructive-sleep-apnea-syndrome. “Obstructive Sleep Apnea,” Mayo Clinic web site, June 15, 2013; http://www.mayoclinic.org/diseases-conditions/obstructive-sleep-apnea/basics/definition/con-20027941. Park, S., “5 Areas of Brain Damage Caused By Obstructive Sleep Apnea,” doctorstevenpark.com , October 16, 2014; http://doctorstevenpark.com/5-areas-of-brain-damage-caused-by-obstructive-sleep-apnea. “Sleep Apnea,” Home Remedies web site, http://www.home-remedies-for-you.com/remedy/Sleep-Apnea.html, last accessed November 11, 2015.